Even the Italians agree there are times when their beloved semolina pasta just doesn’t cut it. On those rare occasions, buckwheat pasta is one such alternative. No meek stand-in, buckwheat pasta has attained its own cult status in the far northern region of Lombardy―where one-pot Pizzocheri is celebrated annually at a flurry of fêtes. Here, buckwheat is serious business. This robust stick-to-the-ribs concoction is made with buckwheat pasta, hearty greens, potatoes, and local cheeses. 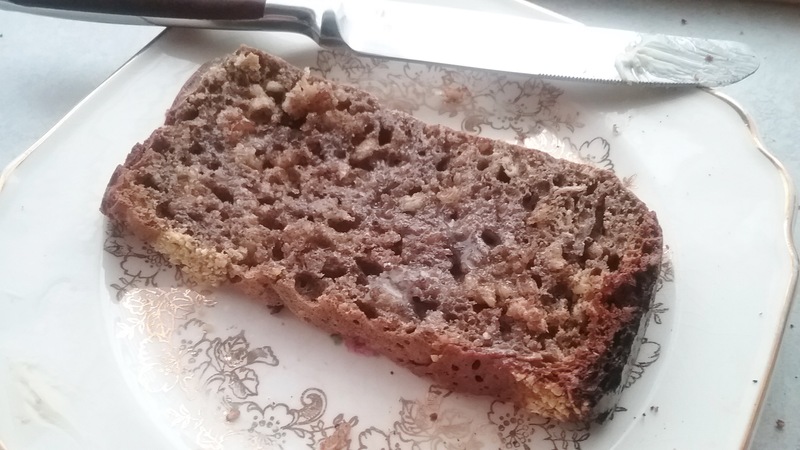 Buckwheat may be an acquired taste for some―it certainly came later for me. When I was growing up, I recall my mom making buckwheat pancakes for my father. I was a pretty good eater, but even then they were harsh tasting and heavy. The big, strong flavors did not fit into my youthful expectations of bland, fluffy pancakes. Somewhere along the line, I made peace with buckwheat and now thoroughly enjoy it. I actually look forward to my morning muesli blend, which currently includes enough toasted buckwheat groats to provide the pronounced nutty, tobacco nuances I’ve grown to appreciate. No question, roasting intensifies buckwheat’s bold flavors. For those still on the fence, consider untoasted groats, a milder version. Most of us are familiar with kasha varnishkes the Eastern European dish containing kasha, or toasted buckwheat, mushrooms, and bowtie pasta―a hearty combo with both buckwheat groats and pasta! The clever Ashkenazi Jews also realized that in preparing the toasted kasha, the addition of egg whites would keep the groats from sticking together. 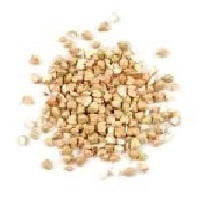 Did you know that buckwheat is not related to wheat nor is it a grain? Rather, it is the seed of a flowering plant in the rhubarb family. Used much like rice, it is quick cooking, extremely versatile, and it has an affinity for onions! 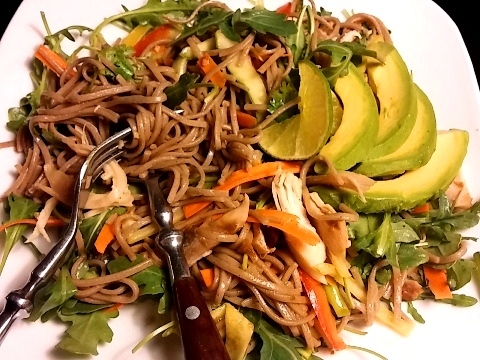 It is a nutritional powerhouse for women: high in protein and lysine, it contains iron, phosphorus, potassium, and substantial amounts of vitamins B and E.
This summer I’ve been dabbling in soba buckwheat noodles and especially love the brown-speckled strands in cool salad laced with plenty of crunchy vegetables. Accented with light, clean, Asian flavors, buckwheat’s boldness offers both balance and richness. 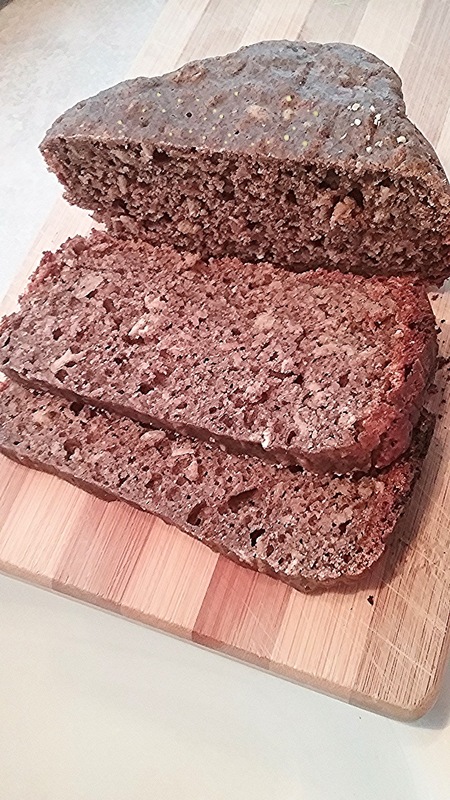 The shared nuttiness of sesame and buckwheat is a stellar example of how simpatico companions can blend beautifully together, creating an even better end result. From a nutritional perspective, soba noodles are far superior to semolina pasta. Although they both have a similar 73 grams of carbohydrates, buckwheat contains 10 grams of dietary fiber, compared to semolina’s 4 grams per serving. Buckwheat’s high fiber content is a boon to appetite appeasement with a slow-release carbohydrate that provides a long lasting energy source. When considering soba noodles, not all are the same. Read the label ingredients carefully to clarify the amount of buckwheat content as well as other ingredients included; avoid those with excessive filler and additives. 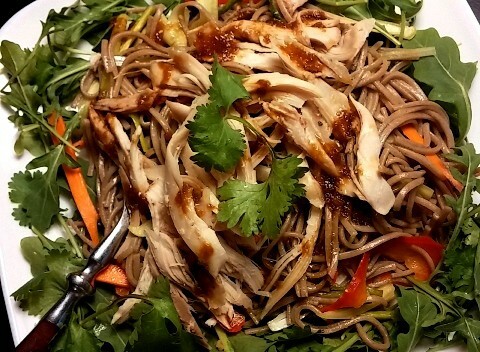 The following Soba Noodle Salad only gets better with time. The noodles do not break down and the vegetables tend to take on a slight tangy pickle as they sit. I change it up by topping it with whatever I have on hand: shredded roast chicken, a fine-quality canned tuna, or generous slices of ripe avocado. It’s all good! For Sesame-Soy Dressing combine all ingredients, adjust seasoning and set aside. To cook noodles, bring large pan of water to a boil, add the noodles and simmer about 7 minutes. Test after 4 minutes, they should be firm and not mushy. Drain, rinse with cold water to cool. Drain well, transfer to large bowl, drizzle with a little of the dressing to lightly coat, and set aside while preparing the vegetables. Add the julienned vegetables as prepped to the bowl of soba noodles. Gently toss the noodles and vegetables together with a bit more of the dressing. Reserve a little dressing for salad assembly. Can be made ahead at this point and chilled. To assemble: Line a large platter, or individual bowls or plates with lettuce; pile the noodles and vegetables in the center. Arrange the chicken or tuna on top. If desired garnish with avocado and cilantro. Drizzle a little more of the dressing over the top. Serves 4 or more.